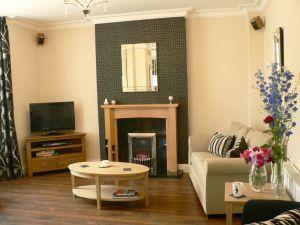 Ashberry Guest House Guest HouseIdeally situated 1 mile from M6, 2 minutes to town centre. Ashberry Guest House a newly-built, sandstone town house in Penrith, The Gateway to the Lakes. Ideal for touring The Lakes, Eden Valley and Scottish Borders. All our 6 en suite bedrooms are individually and tastefully furnished to a high standard. Ground floor accessible bedroom with en suite wet room. All our rooms have wifi, freeview LCD TV's, radio alarm clocks, hairdryers, hospitality tray with a selection of teas, coffee and hot chocolate, bottled water. New, beautifully furnished, 6 bedroom en suite town house, accessible ground floor bedroom, wifi, guest lounge, parking, 1 mile to M6 junction 40. Penrith leisure centre within 200 yds. Children welcome from any age. Ashberry Guest House sometimes limits bookings to 3 or more days. Double room with double aspect, solid oak furniture, contemporary en suite, can be used with room 4 as family suite. From M6 jct 40 take the Scotch Corner exit. From A66 at Kemplay roundabout take the exit to Penrith, pass KFC then B&M and just passed Ullswater Community College, turn left via a slip road just before the traffic lights and Ashberry Guest House and car park on your left. Taxis are available from Penrith rail and bus station. Really recommend Ashberry Guest House; good location, very welcoming owners, clean and comfortable and within a short walking distance of Penrith town centre and the rail station.